Washington, DC — For years, the United States has warily eyed China’s forays into Africa. 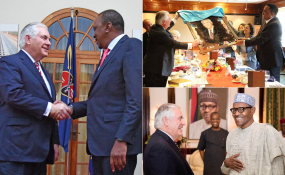 Most recently, Secretary of State Rex Tillerson made headlines for criticizing China’s aggressive commercial strategy during his visit to the continent last month. But it is not only China that is outpacing the United States in capitalizing on Africa’s growing economic importance – and absent greater investor interest and U.S. Government support, American businesses will take a backseat in Africa’s increasingly important markets. Foreign investors are increasingly recognizing that the fundamentals of Africa – including rapid urbanization and a growing workforce and consumer market – are promising. Like other frontier markets, African countries can be challenging places to do business, but canny foreign investors are making money – and those active on the continent are bullish about its prospects. Though total foreign direct investment (FDI) flows into Africa were an underwhelming $59 billion in 2016 (compared to $443 billion for developing Asia, and $142 billion for Latin America and the Caribbean), a third of African countries are headed toward GDP growth of 5 percent or more. African households and businesses are projected to spend $5.6 trillion by 2025. Many investors saw these signs years ago. Leading the pack is China, which is Africa’s largest single trading partner – having overtaken the United States back in 2009 – and more than doubled its FDI projects on the continent in 2016. McKinsey estimates that over 10,000 Chinese firms operate in Africa, earning an estimated $180 billion. And the Chinese government is aggressively supporting this investment push, including by providing loans to Africa: between 2000 and 2015, China’s Export-Import Bank granted 37 times more loans than the U.S. Export-Import Bank. Others are looking to emulate China’s success. Japan hopes to profit from the surge in infrastructure projects across the continent and is stepping up its engagement to make this happen. In 2016, Japan pledged an additional $30 billion in public and private support for economic development. There are also telling signs from Russia, including the fact that Innoprom, a major industrial trade fair organized by Russia’s Ministry of Industry and Trade, has held an annual Russian-African Forum since 2015. In fact, Russia’s trade with Africa grew by a factor of 10 between 2000 and 2012. India’s commercial ties with the continent are greater still, making it Africa’s second largest trading partner. At least 40 African heads of state participated in the 2015 India-Africa Forum Summit, and at a recent Indo-Africa ICT Expo in Lagos, India committed over $4 billion in technology transfers toward Nigeria’s growing ICT sector. With such intense interest in Africa – not just by China and Chinese companies, but a wide range of actors – it’s impossible not to notice the comparative reticence shown by the U.S. Government and American businesses. For the former, it’s time to double down on commercial advocacy and expand tools to support trade and investment. For the latter, it’s time to ditch misperceptions of risk; concerns about corruption and weak governance are certainly valid, but they are not unique to African countries, so there’s no reason for American companies’ poor representation on the continent. American growth depends on an expanding export base, and Africa is the final frontier in commercial markets – it’s as simple as that. If the United States maintains its current, inward-looking trajectory, global competitors will surely profit at its expense. Mr. Grant T. Harris (@Grant_T_Harris) is CEO of Harris Africa Partners LLC and advises companies and organizations with respect to doing business in Africa. He was President Obama’s principal advisor on sub-Saharan Africa in the White House from 2011-2015.